Glass reinforced plastic flat roofs, also called GRP or fibreglass roofs, are an increasingly common choice for flat roofs, thanks to their many benefits. At Smartseal, we are approved suppliers of the Topseal brand of GRP roof, and this is the main system we use for our flat roofs. 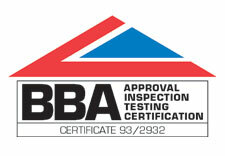 Topseal is a BBA-approved flat roofing system without any joints or seams. This gives it an extremely high level of performance while remaining very light weight. It also has excellent environmental credentials. One of the big attractions of the Topseal system is that it can be finished in any British Standard (BS4800), so can match any building or structure perfectly. Another advantage is that it can be adapted with non-slip properties for areas with heavy foot traffic, such as balconies or walkways. Why choose the Topseal roofing system? A Topseal roof is a single-ply GRP laminate which is applied in situ over an 18mm OSB3 deck. The roof is then finished with pre-formed GRP trims and a coloured top coat. The laminate can be specified in two weights, with the heavier weight suitable for high-traffic areas like balconies and walkways. 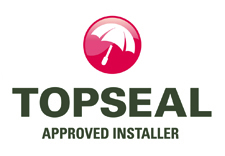 The Topseal roofing system can easily be configured for a warm or cold roof specification. 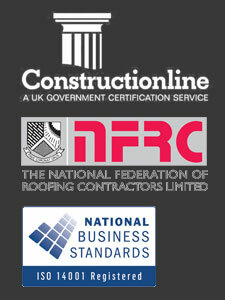 If green credentials are important to you, we can supply specification for a green roof installation on request. You can choose the fascias, soffits and guttering required alongside this. A Topseal roof is a single-ply GRP laminate applied in situ over 18mm OSB3 deck. The roof is finished with pre-formed GRP trims and a pre-pigmented topcoat. Laminate can be specified in two weights 450gsm/m2 and 600g/m2. 450g/m2 for standard installations and 600gsm/m2 for balconies or walkways. Specification for a green roof installation is available upon request and the relevant GreenTop information will be supplied. 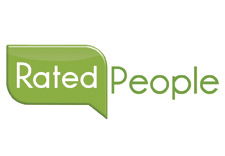 Available in a range of finishes including smooth finish, non -slip finish, coated non-slip. If the substrate is unfit for over boarding then it must be removed. The Decking boards are OSB3 T&G 2.4x.600x 18mm to be laid writing side uppermost. Boards to be laid stagger bonded, off cuts to be used only if longer than 400mm. All boards to be laid on the same day as Topseal is laid to eliminate the possibility of damp boards and de-lamination. Boards installed along a wall and skylight to have an expansion gap of 25mm. Expansion joints are required on roofs greater than 100m2. 4 fixings to be installed across the board width and into every joist spanned. All nail fixings to be ring shank and be galvanised or sheradised. With a minimum of 40mm penetration into the joists. Some installers may wish to use screw guns. Warm roof construction, 12mm ply on top of the joists, vapour check, insulation board, OSB3 18mm T&G boards fixed into the joists, Topseal GRP laminate. 18mm slaters batten to be installed around the perimeter of the roof to support the trim work. Choose the correct trim from our range of pre-formed 3m long trims. ‘A’ trims and ‘B ‘trims must be bonded to the battens using PU adhesive. All trims must be fixed to the decking using galvanised clout nails or staples. All trim joints must be over lapped by a minimum of 50mm. 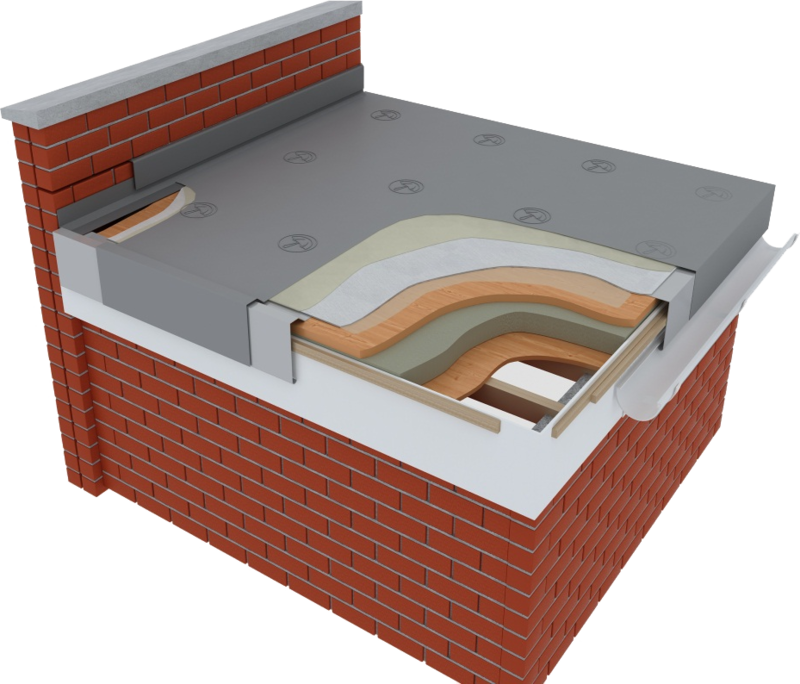 A Topseal roof can be easily configured in either a warm or cold roof specification. For a warm roof, a sub-deck is first fixed to the joists at 300mm centres. A vapour check and insulation sheet is then laid over the top. Insulation sheets can also be purchased with a vapour check adhered to one side. The decking should then be fixed on top as it normally would be, screws should be used to fix the boards to the joists and these should penetrate through the insulation and into the joists to the same depth as standard fixings. It is imperative that all layers of the roof are pressed firmly together and that there are no gaps between any of the layers. The GRP should then be laminated over the top of the roof as normal. These roofs will usually require larger edge trim sizes such as A250 and B300. To comply with the Part L Regulations of October 2010 your local Building Control Officer must be sought to obtain the optimum “U” value.